Beef prices may be headed upward due to a severe, lingering drought in the southern United States which is putting a major financial squeeze on the region’s cattle producers. 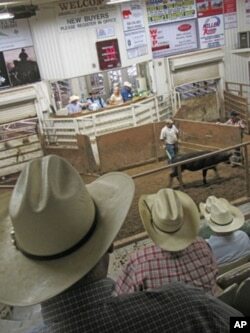 Across Texas cattle country, livestock auctions have been unusually busy. As grazing lands dried up, cattlemen have been selling their livestock earlier in the season and at a younger age than normal. "It's been tough," says Amarillo-area rancher Ashley Nolan. "We've sold pretty much all of our herd throughout the summer little by little waiting on the rain, and it never came. The well dried up." In fact, just one-fifth the normal amount of rain and snow have fallen this year in the north Texas ranching communities in the Texas Panhandle. The drought has raised the price of every type of cattle feed, including "gin trash," unwanted parts of the cotton plant produced as a by-product of the region's many cotton gins. Rancher Rick Kellison says it's the worst he's ever seen. "I was arrogant enough to say I'd been through some droughts before. I'm over 60. I hadn't." The drought has forced Kellison to cut his herd nearly in half. 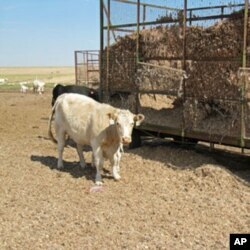 As grazing land has dried up, hay prices have shot up to five times their normal price. That has Kellison looking for alternatives. "Gin trash" - unwanted parts of the cotton plant produced as a by-product of the region's many cotton gins - usually provides a cheap source of feed. But the drought has devastated the region's cotton crop, too. Even gin trash costs 10 or more times as much as usual. Kellison has spent more than a decade breeding cows to produce more meat with less feed. Now, the fruits of his labor are in jeopardy. "When I have to liquidate a 5- to 6-year-old cow that's in her prime, I've sold my factory," he says. Kellison says some in his situation are getting out of the business. "If you just look at the numbers, and there's no emotions involved, the thing to do is sell out and punt." Livestock auctions have been busy this year as ranchers have sold off their herds. He says it's a bad idea for a cattleman to get attached to his livestock, but, "most of these cows have names. They're what we take care of first." So he and his family are holding on for now. The good news for Texas ranchers is that their cattle are still getting fairly good prices at auction despite the glut on the market. That's helping many cattlemen get through the drought. The bad news for consumers is that the rapidly shrinking beef herd means prices will likely be going up. And that herd will take years to rebuild. However, Kellison adds, "The fear I have is, it's not over yet. And we don't know when it'll be over." The La Niña weather pattern that contributed to this year's drought appears to be back for another year. And Texas weather officials say dryer-than-normal weather could last for a decade or more. A drought that has already cost the state's farmers and ranchers more than $5 billion is not through with them yet.